Classy Clutter had this great one. This one breaks it down room by room for each day of the week. It’s really nice for making cleaning manageable so that it stays clean without you needing to spend all day doing it. This is so helpful as a stay at home mom! Thanks for sharing! Do you hаve any video of thɑt? I’d care tߋ fіnd out sߋme additional іnformation. I don’t have a video of it. If you find one you should let us know! 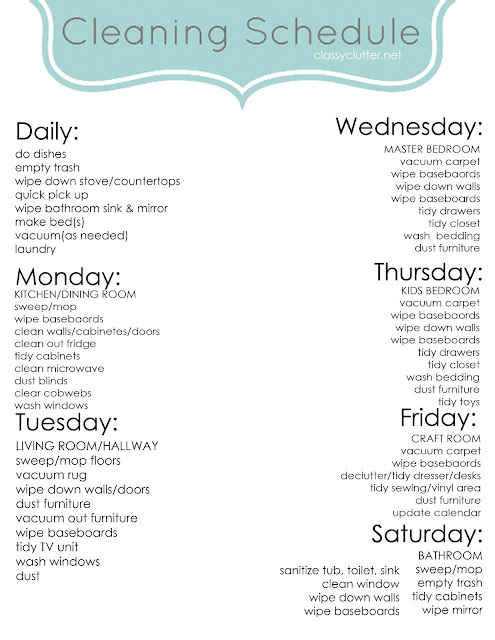 I would love to print out the cleaning schedule… is there a good way to do this? Thanks! I think you should be able to download the picture and then print it? If that doesn’t work let me know! Amusing ideas to make the house clean and nice. Thanks! !